In some ways, I feel like art saved my soul. Art has helped me through really bad times in my life. It’s so weird how it started, but when I was miserable while I was living in Beijing, I would just create a piece and take photos of it and then someone on the other side of the world would say it’s so beautiful. I started hustling away in North America shooting Craiglist gigs or second shooting, or I would just talk to photographers. I learned mostly that I have to trust myself. No one is going to be able to shoot the same way I do or the same things I want. I think I learned more of what I don’t like and learned to trust my own voice. That’s been huge especially as a female: to really want to do something and believe in it and that you can do it. Along the way, I found this little pet (Amelia) and we started making art and then people just went nuts over her. It was a creative side project, which is always so sweet and personal because you just create without any intentions to be famous or anything. She gave me a lot of confidence as well, like that people see something different about me, and that was worth showing. I think the theme of my work has always been pretty, but I don’t want it to just be pretty. I want it to be more. I want there to be a real story behind it, rawness, honesty. It takes a lot of courage and rootedness in who you are to be able to do that because you’re literally putting your heart out on the table for people to cut into pieces. Up ‘til now it’s been a lot of faith, big time faith. I think it’s less about creating the perfect photo, but more about the context of how that photo is made or what goes behind it: the story, the person behind it. It’s the care and the thought you have, and I think that takes a lot more than technique. If I want to shoot a portrait of a girl in another country, I’m thinking about how I see her as a real person. I am not just thinking of taking the best photo ever, but really caring for her. This image might help other people see her how I see her, and I think there’s a lot of intention that goes into that. I have a huge thing towards Asia, or Asian women. My grandma and my mom had it tough and growing up, it’s been such a big conflict. I’m lucky to have the opportunities I have had, but also lucky enough to not have had it super easy. I know that it’s hard getting an education, an opportunity, and breaking out of where you are; that’s why I have such a big heart for them. I was raised in a family that’s more conservative and girls aren’t supposed to have a voice or ask for more. When I see people like that, I just want to tell them how much they’re loved and how much potential they have. I think that’s a big aspect to why my work is always positive or beautiful. I apply it to other things too, whether it’s a hedgehog, still life, or food. It’s been hard to travel and work on projects that take so much emotion out of you without having some kind of stability, and I think that’s why I moved back to Taiwan. I didn’t have a home to return to or a community, and if I kept on taking on projects, I would’ve been burning out and having no things to fill me up when the projects were done. I think I need to have strong roots somewhere before I go out and travel, shoot, and tell stories with no abandon. Waiting is important and the slow seasons are also going to come. I think in the last few months in Taiwan, it’s been such a weird shift: I’ve barely touched my camera, I have no studio, no flat board, no white space, none of my props, my hedgehog died... It’s kind of like being stripped of my paint brushes as a painter. I started writing a lot more and applying my creativity to illustrations or whatever. The months of not doing art was making me go deeper. It was frustrating, but it also has been really good in building up stamina. And if I can stop for this time and then still want to do it, that must mean I really want to do it or I’m meant to do this. And, you realize you can just chill and relax and know that things will be ok. The art of practicing not doing anything. I think not working is actually trusting, and it’s hard. There’s so much unforeseen with the studio, but I was just really shy starting out as an artist. I felt like Amelia was so funny and brought me a lot of joy and helped me see beauty in myself that I couldn’t see for myself. Amelia’ whole brand or everything she’s trying to say is everything I want to say for myself but I say it through her. With her dying, it’s time for me to step into the spotlight and stop putting it on a hedgehog. I definitely feel like it’s learning to see myself the way other people see me or the way other people see Amelia’s work. I definitely have a more critical voice toward myself and my work, who I am and what I’ve done. We can all be more gentle to ourselves. I emphasize so much on her smallness, like do small things with great love. I did feel small, but now it’s just about starting small, but not staying small: thinking big, living big. The beauty of being an artist is having the ability to make ordinary things extraordinary. 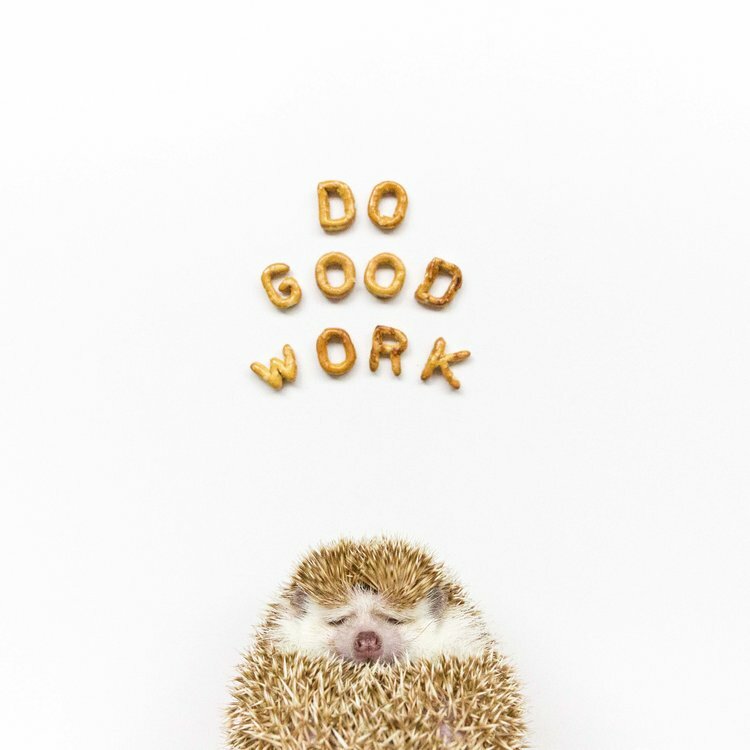 Amelia was the place where it started and I am excited to apply that to everything I work on, not just hedgehogs. I think that’s the beauty of being an artist or having a gift- you build on something, expand it, and you share it in a way that normal people aren’t able to see it.